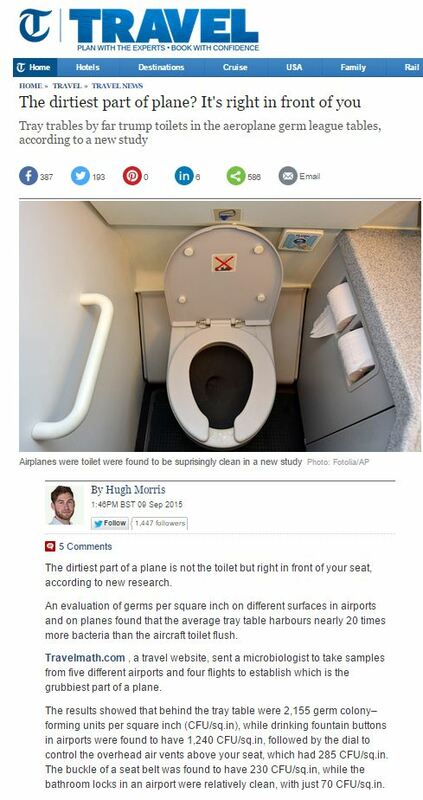 The dirtiest part of a plane is not the toilet but right in front of your seat, according to new research. An evaluation of germs per square inch on different surfaces in airports and on planes found that the average tray table harbours nearly 20 times more bacteria than the aircraft toilet flush. It seems that planes are so filthy that not only did the Telegraph report on this story, but the Daily Mail reported on it twice (on September 3rd and September 5th) and coverage also appeared on CNN, The Atlantic, the LA Times, ABC News and many, many more outlets beside. Clearly, some company hit PR paydirt with this story – but which company? Travelmath.com , a travel website, sent a microbiologist to take samples from five different airports and four flights to establish which is the grubbiest part of a plane. The story came from a travel website, who even created an infographic (now there’s a whole area of PR I’ll get into some time) which featured in both Daily Mail stories. It might seem counterintuitive for a travel company to seemingly seek to put people off flying, but the sheer volume of column inches and news outlets the story secured demonstrates just how effective even apparently-negative stories can be – getting those headlines is all that matters, especially when both Daily Mail articles and the Telegraph coverage all included links to the companies website. Paying for that kind of advertising reach costs far, far more than it takes to put together a quick piece of badpr. This entry was posted in Travelmath and tagged ABC News, Aria Bendix, Chris Kitching, CNN, daily mail, Genevieve Shaw Brown, Hugh Morris, Karla Cripps, LA times, Lizzie Parry, Mary Forgione, telegraph, The Atlantic, Travelmath on October 16, 2015 by Michael Marshall.